Originally introduced during the 2016 Cannes Yachting Festival as project 777 - this new Canados which will be known as Canados 808 Maximus is currently under construction and will be officially presented to the public in September 2017 during the autumn boat shows. The delivery of the first 808 is scheduled for early July 2017. The stepped hull is currently under construction and will be out of the mold at the beginning of February while the deck and superstructure molds are currently being produced. The entire superstructure which lamination will start mid-February will be made of Kevlar/Aramat. The first 808 to be launched will be powered with twin V12 MAN - 1,900 hp coupled to V-Drives that will allow the Maximus to offer a cruising speed in excess of 25 knots and a 30 knots top speed. As every Canados yacht, the 808 Maximus interiors will be fully customized with made in-house furniture from the industry highest quality standards. The Maximus will be available with two different fly bridge layouts and with two different 4-cabin GA. One of these GA offers two owner’s suites, one located on the main deck and the other on the lower deck with additional two twin cabins. The other available layout will be characterized by a VIP and two guests on the lower deck. 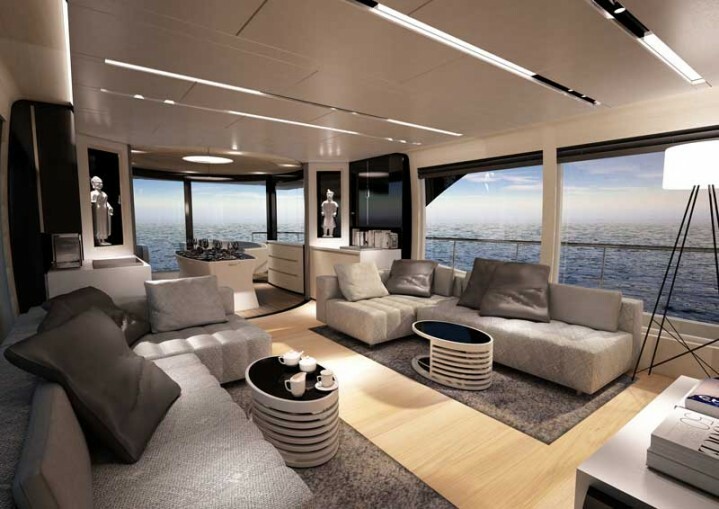 As an option, the 808 can be ordered in a 5-cabin layout, retaining the main deck owner’s suite and 4 guest cabins on the lower deck which is simply unique for a yacht that size. The first 808 is being built in the two-owner cabins version. Designed by Rome based Marco Casali, the mission he was assigned with was extremely clear. This new model had to retain the “modern-classic” DNA of the 70 years old shipyard thus introducing new solutions to offer all the amenities and usage plan of a 30-meter + yacht. 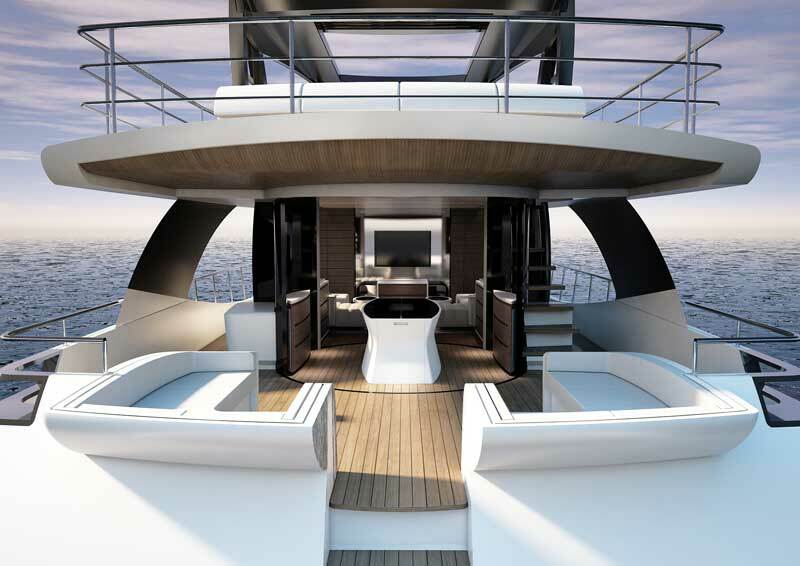 In short, Casali was requested to incorporate all the amenities and comfort usually found on yachts above 30 meters in a 24,60-meter yacht with a CE length at 23,10 meter. The challenge was even more complicated as the parameters given by Canados’ technical office had the main objective to maintain the legendary sea going capabilities our vessels have always been known for. In order to offer a vast aft deck and a superyacht feeling, the entire concept of this space has been revisited. The hydraulic gangway will be installed to the center allowing for a much wider one which will also be adaptable to a wheelchair. Thus, the usual aft sofa convertible into an external dining area has been replaced by two lateral molded terraces. The two terraces are partially suspended above the swimming platform (that is also a tender lift as per the standard equipment list) offering an increased deck space. Both L shaped balconies are equipped with a table allowing to be converted in a sun pad. The usual aft saloon sliding door has been replaced by a revolving glass veranda made of only two 180 degree panels. This veranda houses the dining room that can be either part of the interior or the exterior by the movement of the two revolving glass panels. The Canados 808 Maximus width of 6,25 meter enabled to create extremely comfortable side passages allowing to move from the aft deck to the foredeck during navigation in full safety. For owner’s operated boats, the passages are wide enough to live the fender inside without obstructing the way. The generous dimensions will also allow to move around even when the two side pantograph doors, one for the galley and one for the wheelhouse, are left open. 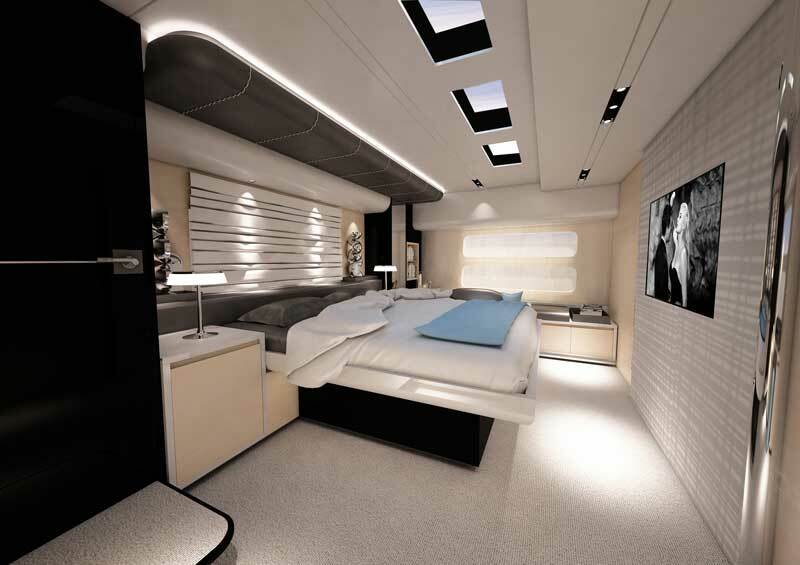 On the aft section, the passageways are equipped with fashion plates with built-in fixed glass windows. The bow is equipped with a generous built-in lounge where to enjoy breakfast or light lunch. This area is protected by the standard micro-perforated shade with 4 carbon fiber poles with tensioners. Service will be facilitated by the proximity to the side galley door. Aft of the sofa are three glass panels recessed in the roof. These panels are skylights flooding the master suite with natural light. To the front of the lounge is a sun-pad and another skylight above the sink of the split level owners’ bathroom. While saloons of all similar sized yachts are equipped with one L shaped sofa, the Canados 808 Maximus is equipped with two face-to-face sofas, thanks to the relocation of the dining table aft. Thus, the two sofas allow for enhanced comfort and true social interaction. This configuration offers not only a central passage and perfect symmetry, it also allows installing a 60” LCD TV in the fore bulkhead. Further forward to starboard, is the galley accessible from the saloon, from the exterior side passage for easier provisioning and easiness of crew work, and from the wheelhouse equipped with its own corner sofa. A day head is located to port side passed the lower deck access stairway. The master suite is installed two steps down the saloon level on the main deck. The usage of the entire volume of the roof and raised passageways allowed Casali to create an incredible master suite that offers a 2,20-meter headroom. The signature Canados horizontal portholes offer unobstructed sea view while the skylights will flood the cabin with natural day light. Being wide body, the master suite will also offer a side sofa and the lowest sound level in the category allowing the owner to enjoy taking a nap during navigation. Three steps down from the cabin, the oversized walk in wardrobe is located in the passage to the bathroom, that will also offer the largest volume and shower in the category. The layout plan has been studied to create separate circulation areas for the crew. The access to the crew cabin is from the aft deck. Thus, when guests are enjoying the foredeck at anchor, the crew can still access their private quarters without interfering. From the crew quarters, a watertight door allows direct access to the engine room. Here again, the concept of usage is inspired from the one of much larger yachts where privacy is usually paramount to owners. The starboard side of the transom is equipped with a 3,40-meter tender garage that will host either a RIB jet tender or a PWC. In the latter case, the swim platform is equipped with an 800 kg capacity tender lift for a tender up to 4 meter. 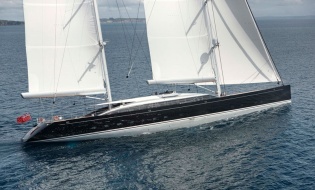 Yachts of that size are only available in four cabin versions. Their layout always calls for lower deck master cabin aft, to immediate vicinity of the engine room and its noisier environment. The Canados 808 Maximus is absolutely unique, offering a main deck owner’ suite, far from the engine room, while its full beam lower deck VIP suite is the equivalent of the best master cabin found in competitive yachts. Where the Maximus is even more unique is in the fact she is available in a 5-cabin version, making it the only yacht that size offering such capacity. A unique factor for charter operated yachts. “As we call it internally, the Canados 808 project was created to merge the famous Canados heritage with new solutions seeking for more volumes and better use of space. Our main target was to create a very special space for the owner’s suite, fully independent from guest-quarters and on a higher level than the typical lower deck level. In order to achieve this result we had to stagger the main deck floor into three slightly different levels which also resulted in a large roof area fully equipped with a sofa and a sun pad. The main profile characteristic consists in the floor to ceiling curved side windows where the connection between exterior and interior from the sides is studied to literally disappear. The same path was followed for the aft deck and saloon layout that are joined by a circular veranda space that connects the two spaces and allow to turn them into a unique space (when open) or interfacing the dining area with one or the other space. The central transom stairs allow for a wider gangway, shaping a unique aft design with a deep platform and two side sofas in the beach area.